As useful as ebooks are, they don’t really take much advantage of the potential that an Internet connected device offers for enhancing the reading experience. Readmill is a Germany-based startup looking to change that. The Berlin team has created a platform that allows developers to add social features into their ebook readers and other book apps, offering the ability for users to share reading data, their favourite sections of books and book recommendations. Essentially, it’s a kind of ‘Last.fm’ for reading’. To kick the whole thing off, there’s a Readmill iPad app that allows you to read a selection of mainly public domain titles. 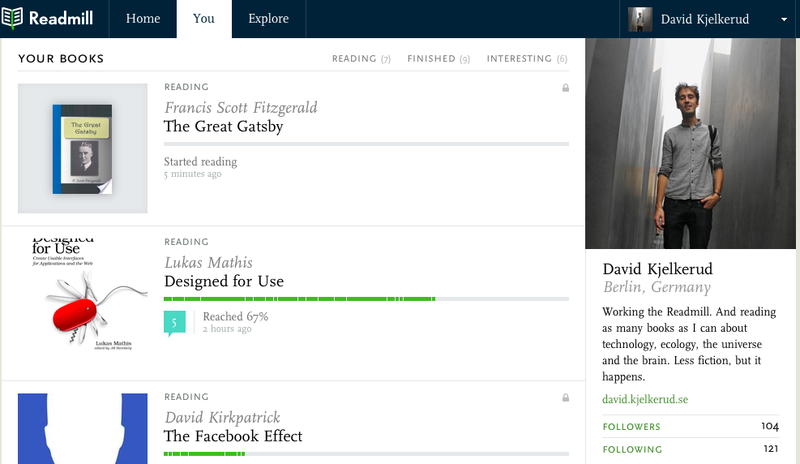 As you read books, your Readmill profile keeps track of your progress through them, including the time you’ve spent reading each, and allows you and other users to discuss books via a comment thread. While the selection of books on the Readmill app isn’t currently the greatest, it’s intended as a showcase for what would be possible if other ebook companies integrated the service into their own apps in the same way that, say, Spotify allows you to publish your listening data to your Last.fm profile. 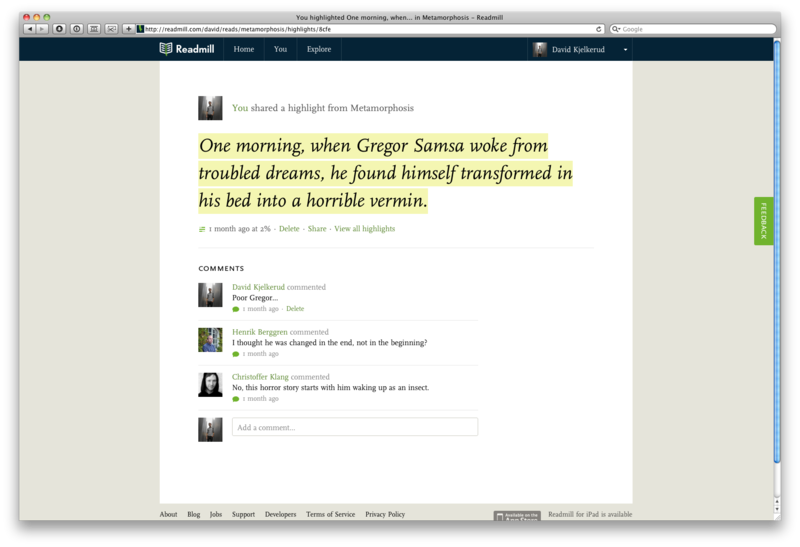 Today, Readmill is rolling out its latest feature – social highlights. 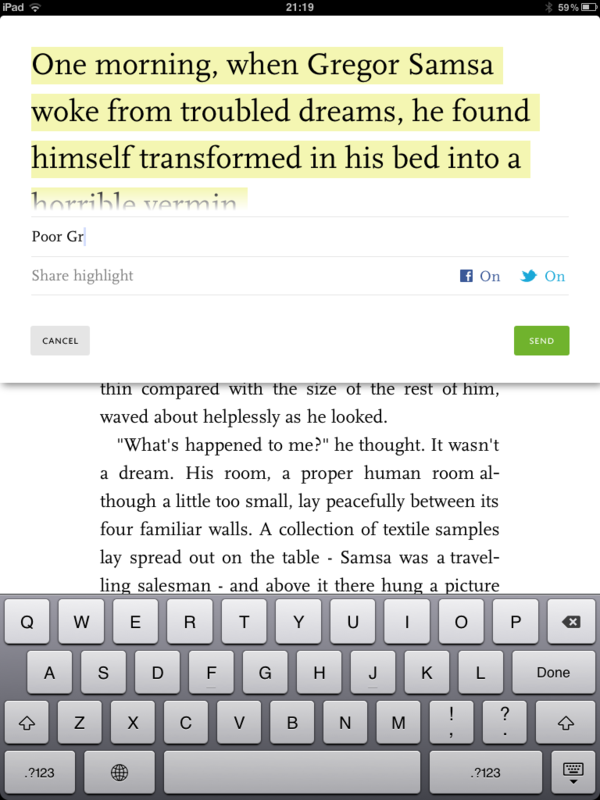 This allows you to highlight any passage in a book, add an optional comment, and then share it to Twitter and Facebook. This highlight is then available on the Web via a permanent link, allowing it to be passed around and discussed. You can also browse other users’ highlights from the book you’re reading. This acts as a good way of discovering users with similar taste to you, as you can then visit their profile to find out more about their reading habits.Users can of course check what other highlights that has been done in the book as well as checking what other books are being read by that user. Competition also comes from the likes of Goodreads and Amazon’s Shelfari, although Readmill’s automated approach means that, assuming third-party e-book app developers adopt it, it could see a strong following of avid readers get on board. There’s no effort required to keep others up to date with what you’re reading, but there’s still scope for getting stuck into to some serious discussion around your favourite titles if you choose. 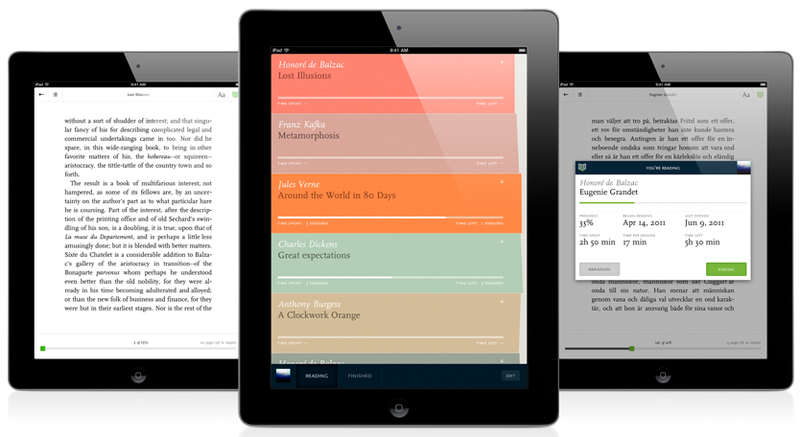 Both the Readmill iPad app and the platform for developers are currently in private beta. However, we’ve been given 500 invites for The Next Web readers to try it. To sign up, simply visit http://readmill.com/invite/thenextweb. Be quick though, they’re sure to go fast.